There are a variety of types of plastic tubing you may come across in the home. You might need different tools for each depending on the gauge or thickness of the tubing and its material. Most plastic can be easily cut with tools you already have in the home or workshop, such as a utility knife, a hacksaw or even a piece of string. 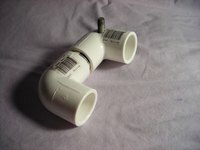 Tubing such as light gauge plumbing tubing used for temporary purposes is usually not much thicker than a beverage bottle. With a steady hand and a utility knife, you can cut right through it. Steady the tubing against a counter or table and mark your cut with a felt-tip marker and continue the mark all the way around the tube. Stab the point of the utility knife (carefully) in to start the cut and slowly work your way around. The lightness of the tube works against you here, as it is hard to keep a straight line, but if you work slowly and rotate the tube as you go, you should be successful. You can also try a serrated knife or light saw, such as a sheetrock saw. It may be easier to keep a straight line, but these tools can rip up the lightweight tubing. Hacksaws will quickly cut through PVC and other types of heavy plastic tubing. Mark the pipe and use a miter box to ensure a clean, straight cut. Start slowly until the saw gets a bite, then you can increase your speed. Use a dust mask to protect yourself from inhaling any particles. A quick sand with 100 grit sandpaper can remove any debris connected to the tubing so you can make a clean fitting. PVC cutters custom made to cut PVC tubing are available at hardware stores; these are an option if you are doing a lot of work with PVC. In a tight spot, a piece of wound cotton string or cord can also cut PVC (if the tubing is jammed against a wall, for instance). Slide the string behind the tubing and pull it back and forth until it grips. Once the string is embedded in the PVC, just keep going and applying pressure until you cut through.